In the world of skincare and cosmetics we are often inundated with so many different choices and steps that selecting the right products can seem overwhelming, but with Thayers Witch Hazel Rose Petal Toner your daily skin care process may become simpler than ever. While most of us would not suggest a complicated 20-step skincare regimen for any age bracket, many of us do have a need for a good go-to daily toner, which can enhance our daily skincare routines, and make them more effective. The need for a good toner in any skincare regimen is also generally recommended by dermatologists, makeup artists, and skincare experts, but how do you find the best toner on the market? And how can you find the perfect toner suited to your own skin type and sensitivities? We decided to review a highly-rated toner that suggests its suitable for all types of skin, Thayers Rose Petal Alcohol-Free Witch Hazel with Aloe Vera Formula. The product restores hydration and absorbs excess oil production in one go, making it ideal for dry, combination skin and oily types alike. It’s said to be the holy grail of toning, but why? Does Thayers’ product live up to promises of leaving the skin dewy fresh with restored radiance at under $10 using rose petal water, or is it hype? We investigated and reviewed it to find out. This organic product is a blend of rose petals, aloe vera, Vitamin C and proprietary witch hazel, the latter being the first differentiation factor of Thayers offering. Even better, the product is completely free of alcohol, and as a general rule of thumb, most companies list this as a first or second ingredient in toners. Witch Hazel acts as a topical astringent aid in fighting acne, shrinks pores, reduces inflammation and heals redness. The company product motto is “it makes your skin bloom,” in reference to a cocktail of fruits and florals. I felt my skin looked incredibly radiant, fresh, and was left with a dewy glow after washing my face and then using it. It also did not break out or irritate my sensitive acne-prone skin, making it highly suitable for those of varying skin types, including sensitive skin. The ingredients are all organic and natural and considered highly safe unless there is a specific allergy present. All of the ingredients work in tandem to promote healing, hydration, decrease inflammation and decrease and overproduction of oil. The result is a clean, stunning complexion. Thayer’s offers a full money- back guarantee for any customer concern, allergy or issue. The product can be returned for a full price refund or exchanged for a more suitable item. Apply to the skin using a clean cotton ball or washcloth, after using a daily cleanser. Remove any excess product residue. Follow with serum and moisturizer or any regular routine. Thayers Witch Hazel Toner: Worth It Winner? 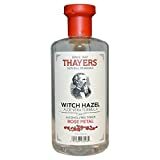 Thayers Witch Hazel Toner is a solid offering and stands out amongst its competition in the market. They have made a product that is safe, organic, gentle and can be used on any skin type. Even those with sensitive skin can enjoy the benefits of the product. The all natural organic plant and fruit based ingredients give the toner a wonderful scent as well as benefits to the skin. Customers can expect to be left with fresh, even and radiant skin at a low cost. You can also expect to be free of any residue, makeup or product build up. We love the alcohol free formulation of this product as it does not dry out the skin or cause irritation. The aesthetic of the bottle and packaging are an added bonus. It seems to provide a great value and remarkable benefits, with continual daily use, and has longevity. This product is definitely recommended for those of any skin type looking for an added boost to the skin and a fresh glow. Definitely hype and 5/5 stars!